AbiquiÃº Reservoir/Dam was constructed in 1963 by the U.S. Army Corps of Engineers. 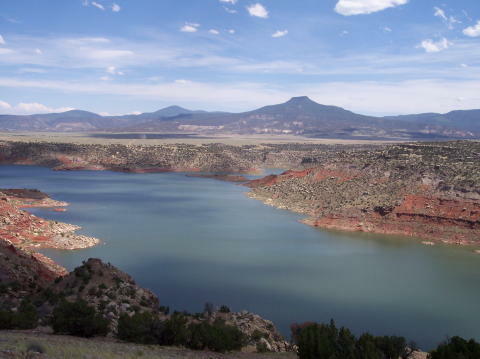 The Abiquiú Lake now covers about 2,000 acres of former Ghost Ranch land. This is the second of three dams constructed on the Chama River watershed between 1935 and 1972. The lake has recreation facilities for picnicking, walking, swimming, fishing, boating, water skiing and camping. This 4000-acre lake with camping at Riana Campground includes excellent facilities surrounded by red sandstone cliffs and mesas. The Abiquiú Village was settled following a 1754 Spanish land grant to Hispanicized Indians (Genizaros) and was a frontier settlement for more than 80 years. In the 18th and 19th centuries, Abiquiú was a center of trade for Plains and Pueblo Indians, and a point of departure for those traveling along the northern Spanish Trail to Spanish settlements in California. A Catholic church built by the community in the 1930’s has become the Plaza’s centerpiece. 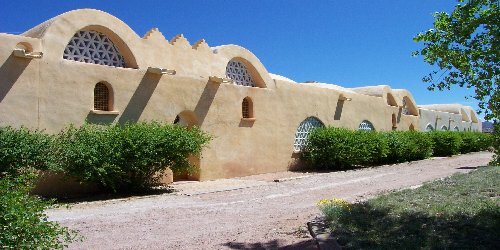 Santa Rosa de Abiquiú: This site is off US Highway 84 just south of Abiquiú. The ruins are the remnants of the original Spanish settlement. Santa Rosa de Abiquiú was built in the 1730’s, abandoned in 1748 because of Indian raids, resettled in 1750, and again abandoned when the population moved into the Genizaro pueblo (current Abiquiú pueblo). Photo Instructions: Remember the Abiquiú Village is located on private land similar to an Indian Pueblo so please follow pueblo etiquette and do not take photographs of people or buildings without obtaining permission first. Distance: (from Ghost Ranch) Approximately 12.5 miles south of Ghost Ranch. Directions: (from Ghost Ranch) To get there from Ghost Ranch, turn left at Ghost Ranch gate onto HWY 84 and head south for approximately 12.5 miles. This tiny village was established after the Spanish reconquest of New Mexico in 1680. Historically, Chimayó was founded near the end of the 17th century by Spanish settlers in a fertile valley nourished by the Santa Cruz River and protected by the surrounding foothills. The word chimayó means “good flaking stone” and refers to the abundant supply of volcanic obsidian glass in the area. It is also the location of El Sanctuario (The Shrine) de Chimayó, a small adobe church noted for the healing power of its dirt. 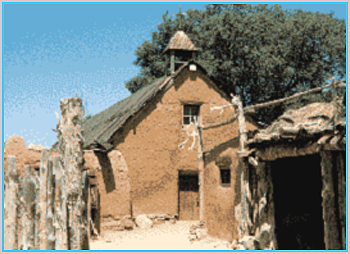 ChimayÃ³ is home to many traditional weavers with roots deep in old Spanish Colonial New Mexico for over 300 years. The drive from Santa Fe to Chimayó is filled with scenic rolling mesas and copper-colored hills. Pilgrims make their walk to El Santuario de Chimayó every year during Holy Week in New Mexico. 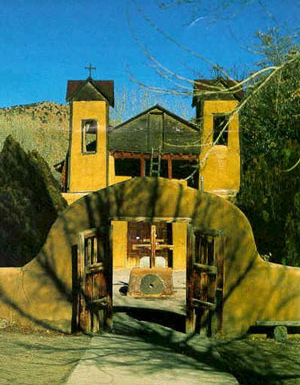 El Santuario de Chimayó – Originally a private chapel, constructed from 1814 to 1816, it was bought by a private group in 1929 and turned over to the Archdiocese of Santa Fe. It is noted for the healing powers of the “Tierra Bendita” (sacred earth). 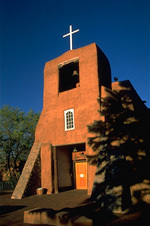 This adobe church was designated as a “National Historic Landmark” in 1970 by the U.S. Department of the Interior. Distance: (from Ghost Ranch) Approximately 45 miles south of Ghost Ranch. Directions: (from Ghost Ranch) Turn left at the Ghost Ranch gate onto US Highway 84 and head south to Route 76. Chimayó is 7 miles east of Española. 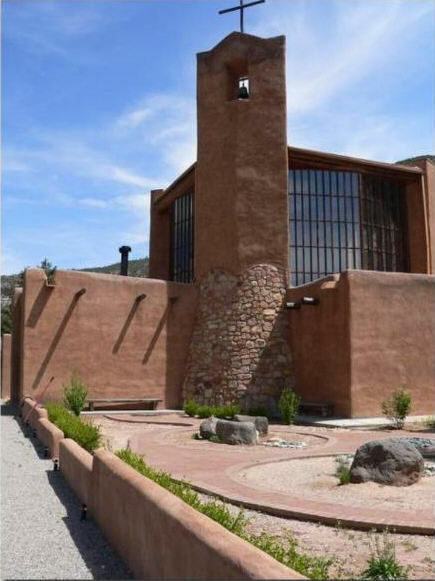 High in the foothills of the Sangre de Christo Mountains, El Santuario de Chimayó is one mile south of the intersection of Highways 76 & 520. This Benedictine Abbey is located in a beautiful and isolated spot on the Chama River. The road is not totally maintained, and is often impassable after snow or rain storms. No shorts or bare shoulders in the chapel, refectory or guesthouse area, please. And please be aware too that there are places of strict silence such as the chapel, the sacristy and the entire convento (the building next to the chapel). The monks practice the Benedictine life of prayer, reading, and manual labor which now also includes a beautiful scriptorium on their web site www.christdesert.org. Distance: (from Ghost Ranch) 15 miles northwest of Ghost Ranch, however, because of the road it takes about 50-60 minutes to drive on a good day. Directions: (from Ghost Ranch) Turn right at Ghost Ranch gate onto Hwy 84 for about 2.5 miles. Turn left on Rd 151. Continue on the dirt road for another 13 miles. 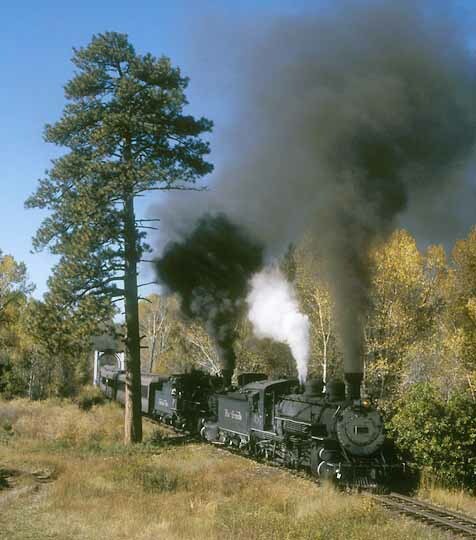 Built 125 years ago and little changed since, the Cumbres & Toltec Scenic Railroad is a 64-mile, fully operational steam railroad jointly owned by the states of Colorado and New Mexico. The C&TS is recognized around the world for its spectacular scenery and unspoiled vistas, as well as the historic rolling stock and railroad structures that are preserved on the line. Many of the buildings and much of the railroad equipment date to the turn of the twentieth century or earlier, making the C&TS the best preserved steam era railroad in North America. All trains stop for lunch (included in the fare) at Osier, Colorado, roughly the mid-point of the railroad. Reservations and Purchasing Tickets: You can purchase tickets via the CT&S secure web site www.cumbrestoltec.com, or by calling 1-888-CUMBRES (1-888-286-2737). We recommend that you make your reservations early-at least two weeks in advance. By purchasing ahead of time, they can mail your tickets so that you can avoid lines at the ticket counter. If you do plan to buy your tickets at one of the stations, please arrive no later than 9:00 a.m.
Dar al Islam is dedicated to the betterment of our society, and strives to achieve its purpose through education in the broadest sense, through cooperation and networking, and through programs which benefit both Muslim and non-Muslim people of North America. Founded 20 years ago, Dar al Islam built the North African-style mosque and attached madressa, or school, with the dream of starting a model village showcasing Islam in America. The Dar al Islam Mosque and Madressa were constructed in the early 1980’s, this large training and worship structure contains a school, a library complex, elaborate prayer rooms and living quarters. Location: Rio Arriba, US Highway 84, 18 miles NW of Española. Distance: (from Ghost Ranch) Approximately 18 miles south of Ghost Ranch. Directions: (from Ghost Ranch) Turn left at Ghost Ranch gate onto Highway 84, drive south about 12 miles. A little ways past the Abiquiú Elementary School, turn left on County Road 155 and follow the unpaved road for about 2 miles until you come to the overhead Dar al Islam main entrance sign on your left. Then continue up to the mosque. Visitors are welcome, but advance arrangements are advised 505-685-4515. Visit www.daralislam.org. This National Forest Service facility includes a short hiking trail, a picnic area and camping site. The sandstone walls provide a resonance that is well worth the trip. A geologic display explains the various formations in the cliffs. A ten-minute walk from the parking area leads you to this ‘theater’ naturally hollowed out of sandstone by ages of erosion. The concave sandsone cliffs create ever lasting echos. Location: Rio Arriba, US Highway 84, 17 miles NW of Abiquiú Distance: (from Ghost Ranch) Approximately 4 miles North of Ghost Ranch. Directions: (from Ghost Ranch) Turn right at Ghost Ranch gate onto Highway 84 and drive approximately 4 miles north. The village of El Rito is an oasis in the beautiful, high desert country of northern New Mexico. 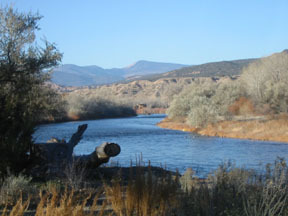 El Rito is surrounded by mountains and borders the vast Carson National Forest. Because of the unique tricultural history of El Rito, the Northen New Mexico Community College El Rito Campus offers a number of innovative programs that showcase the rich cultural resources found only in this part of New Mexico. El Rito artists include pottery, painting, tin, sculpture, printmaking and weaving. Location: Rio Arriba, US Highway 84, on 554; 18 miles NW of Española, 15 miles NW of Ojo Caliente Distance: (from Ghost Ranch) Approximately 28 miles south of Ghost Ranch. Directions: (from Ghost Ranch) Turn left at Ghost Ranch gate onto Hwy 84, drive 16 miles South to Rt 554. Make a left turn on Rt 554. Continue for 12 miles to town of El Rito. El Rito is also the home of the El Farolito Restaurant, featured on American Public Media’s The Splendid Table. The centerpiece of Historic Los Luceros is the elegant Casa Grande. Constructed in the 1800’s, this beautiful home was owned by Mary Cabot Wheelwright from 1923 to 1958. Furnishings in the Casa Grande are representative of the Wheelwright era. Listed on New Mexico’s Register of Cultural Properties and the National Register of Historic Places, this 140 acre site brings to life the important link between the natural beauty of the Rio Grande Valley and the diverse cultures that contribute to its rich history. Open 10a – 4pm, $5 per person, also a Café and artists’ gallery. Location: Near Alcalde, New Mexico, 8 miles north of Espanola on Hwy 68 then left on county road 0048. For more information call 505-852-1895. Los Ojos, meaning “the springs” is located near the base of the Los Brazos cliffs. The historic Los Ojos Village, known for its distinct blend of Victorian and traditional adobe architecture and its community effort to revitalize the local economy through the development of agricultural based, culturally valued enterprises, has much to offer visitors. Watch the process of mat-making at Otra Vuelta, or view prints, photographs & paintings at Yellow Earth Gallery. Be sure to Take the opportunity to step into the tranquillity of San Jose Church, which is over 100 years old. Commercial ventures include Pastores General Store, Otra Vuelta Tire Recycling, and Tierra Wools, a weavers’ collaborative (see below). Members of Ganados often teach Ghost Ranch seminars featuring traditional arts. Location: Rio Arriba, fifteen miles south of Chama and five miles north of Tierra Amarilla, just west of US Highway 84. Distance: (from Ghost Ranch) Los Ojos is approximately 32 miles north of Ghost Ranch. Directions: (from Ghost Ranch) Turn right at Ghost Ranch gate onto US Hwy 84 for about 30 miles north. Turn left at State Road 112 and make an immediate right. Continue down hill to the town of Los Ojos. One of the oldest health resorts in North America, Ojo Caliente Mineral Springs is the only natural hot springs in the world with the remarkable combination of four geothermal mineral waters. Once considered sacred by the ancestors of today’s Tewa tribes, these ancient peoples built their Pueblo overlooking the springs. Posi or Poseuinge, “village at the place of the green bubbling hot springs” was home to thousands of people. 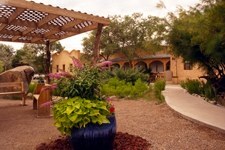 Today, Ojo Caliente offers a peaceful, unpretentious atmosphere. Step out of the stresses of everyday life and discover the healing nature that has made these waters legendary. Relax, rejuvenate, enjoy! Location: Rio Arriba, Taos; US Highway 285, 26 miles north of Española Distance: (from Ghost Ranch) Approximately 50 miles southeast of Ghost Ranch. Directions: (from Ghost Ranch) Turn left at Ghost Ranch gate onto Hwy 84, for about 27 miles until you see a sign for Route 285, turn left. Continue for about another 20 miles. The Ojo Caliente Mineral Springs sign is on left side. Prices and additional information is available at www.ojocalientespa.com. Take a journey to the past at “The Ranch of the Swallows”. This historic ranch and living history museum, dates from the early 1700’s and was an important stopping point along the famous Camino Real, the Royal Road, from Mexico City to Santa Fe, New Mexico. 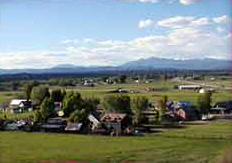 The ranch is located on 200 acres in a farming valley just south of Santa Fe. Original colonial buildings on the site date from the early 18th century. 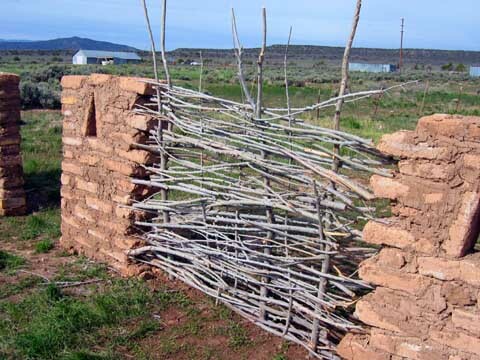 In addition, historic buildings from other parts of northern New Mexico have been reconstructed at Las Golondrinas. Villagers clothed in the styles of the times show how life was lived in early New Mexico. Distance (from Ghost Ranch): Approximately 65 miles southeast of Ghost Ranch. Directions (from Ghost Ranch): To get there from Ghost Ranch, turn left at Ghost Ranch gate onto HWY 84 and head southeast following the highway signs to Santa Fe for approximately 50 miles to I25. Take I-25 south and exit on 276, following “Las Golondrinas” signs. Head north on the 599 Bypass. Get into the left lane right away and take a left on West Frontage Rd. Go about 1/2 mile, and take a right on Los Pinos Rd. Travel 3.2 miles on Los Pinos Rd. Las Golondrinas is 15 minutes south of the Santa Fe Plaza and 45 minutes north of Albuquerque, at 334 Los Pinos Rd. Visit http://www.golondrinas.org. The full name of Santa Fe, the location of New Mexico’s state capital, is “La Villa Real de la Santa Fe de San Francisco de Asis,” or “The Royal City of the Holy Faith of Saint Francis of Assisi.” Santa Fe, which means “Holy Faith,” was founded in 1607 (the second oldest town in the U.S.) and joined the United States of America in 1912. It is well know that Santa Fe is rich in art, architecture and history. The city is one of the largest art markets in the world, with hundreds of art galleries and many museums. Outside New Mexico most are surprised to discover Santa Fe is the oldest capital city in the United States. Location: Santa Fe, state capital; on US Highway 84, 85, 285, and I-25, 20 miles E of Rio Grande. Santa Fe is 7,000 feet above sea level, and lies at the base of the Sangre de Criso mountains. The Santa Fe National Forest includes the Dome Wilderness, the San Pedro Parks Wilderness, the Chama River Canyon Wilderness, and the huge Pecos Wilderness in the Sangre de Cristos. Distance: (from Ghost Ranch) Approximately 50 miles southeast of Ghost Ranch. Directions: (from Ghost Ranch) To get there from Ghost Ranch, turn left at Ghost Ranch gate onto HWY 84 and head southeast following the highway signs for approximately 50 miles. Visit www.santefe.org. Tierra Wools is a spinning, hand dyeing, and hand weaving workshop and a retail store. They buy local wool, wash it, spin it, and weave the yarn into beautiful weavings which are sold from their workshop in Los Ojos, a small village in the Chama Valley of northern New Mexico (see above). The enterprise is operated by Los Ojos Handweavers, LLC, a limited liability company owned by the growers, washers, spinners and hand weavers that produce its goods, as well as supporting investors. Many of the weavers of Tierra Wools descend from Spanish immigrants who settled in the Rio Grande Valley as early as the 16th century, with latter waves of immigrants from Spain and Mexico. Sheep raising was the economic mainstay of these settlers and the textiles produced by them were called “Rio Grande blankets.” This weaving style was influenced by a mix of Spanish, Mexican and Indian designs, and characterized by the use of stripes and bands, saltillo diamonds (diamond pattern usually in center of weaving), and Vallero stars (six pointed star). Distance: (from Ghost Ranch) Tierra wools is in Los Ojos which is approximately 32 miles north of Ghost Ranch. Directions: (from Ghost Ranch) Turn right at Ghost Ranch gate onto US Hwy 84 for about 30 miles north. Turn left at State Road 112 and make an immediate right. Continue down hill to the town of Los Ojos. Visit www.handweavers.com. Book Sources: Valley of Shining Stone, Lesley Poling-Kempes, © 1997 by the University of Arizona Press. This valuable book tells the story and history of Abiquiú, Georgia O’Keeffe in Abiquiú, the Chama Valley, and Piedra Lumbre (Shining Stone) from prehispanic days through the present. 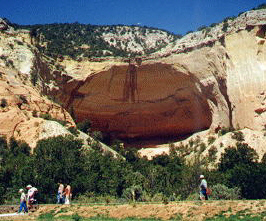 Explore more information and suggestions from www.newmexico.org (official New Mexico tourism site), www.digitalabiquiu.com (excellent resource for local activities) or www.abiquiustudiotour.org (includes local artists directory and links to on-line galleries). Photo credits for WUULF website and catalogs are courtesy of: (©) J. Allison, M. Baker, L. Bessen, C. Bosler, C. Bouijila, R. Brown, M. Eastman, J. Eldredge, M. Evans, M. Fesgen, B. Greenlaw, C. Hachmeister, K. Hahn, A. Lassen, R. Lee, S. Madsen, H. McRae, L. McRae, M. Neal, S. Newman, L. Simmons, B. Shay, Vaughan Photo or with permission from websites noted in descriptions.